About two years after her mother’s death in 2010, Lyla Saigh and her husband, Bill, opened several boxes full of Rosemary Hakim’s possessions. They discovered photos and Hakim’s memoir titled Arabian Antipodes. The mementos painted a picture of Hakim’s life: She had been crowned Miss Lebanese America, and she traveled to Lebanon and served as an ambassador for the Arab-American community. Lyla, who owns a Lebanese catering and carryout business in Grosse Pointe Woods, and Bill knew throwing away the documents would be a mistake. 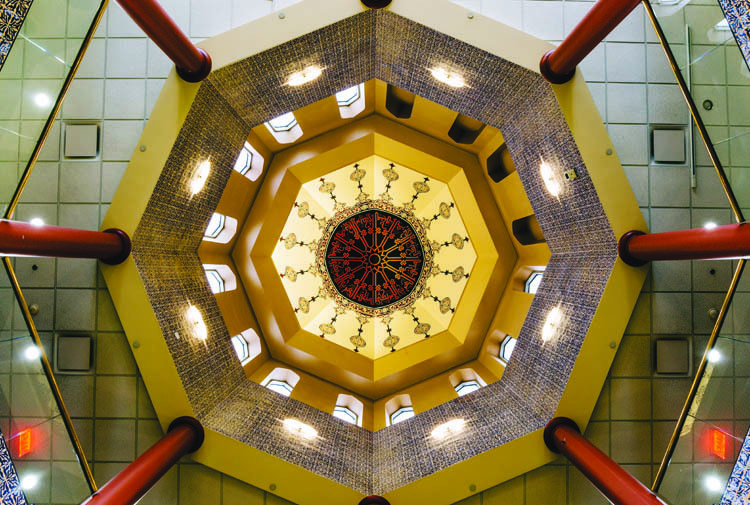 She called the Arab American National Museum in Dearborn, which put the documents in an online digital archive. 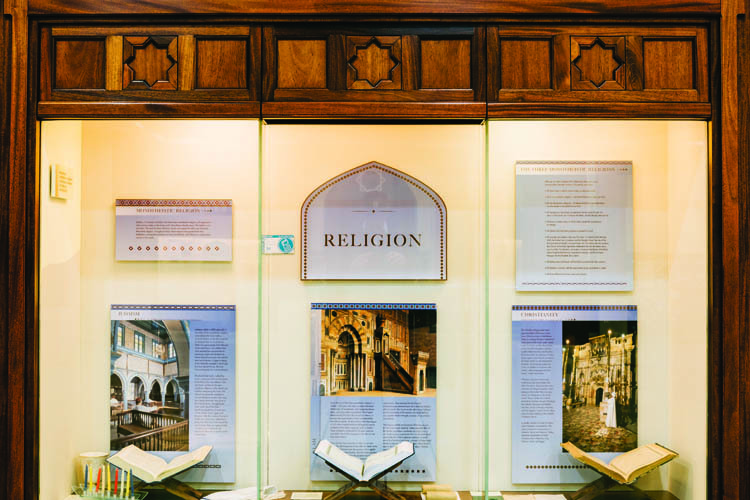 Stories such as Hakim’s are laced among the museum’s three floors, waiting to be discovered by the 51,000 people who visit each year. The first and only museum of its kind in the United States, its location could not have been more appropriate. With 96,000 people residing in the city of Dearborn, roughly one-third of the population is Arabic. 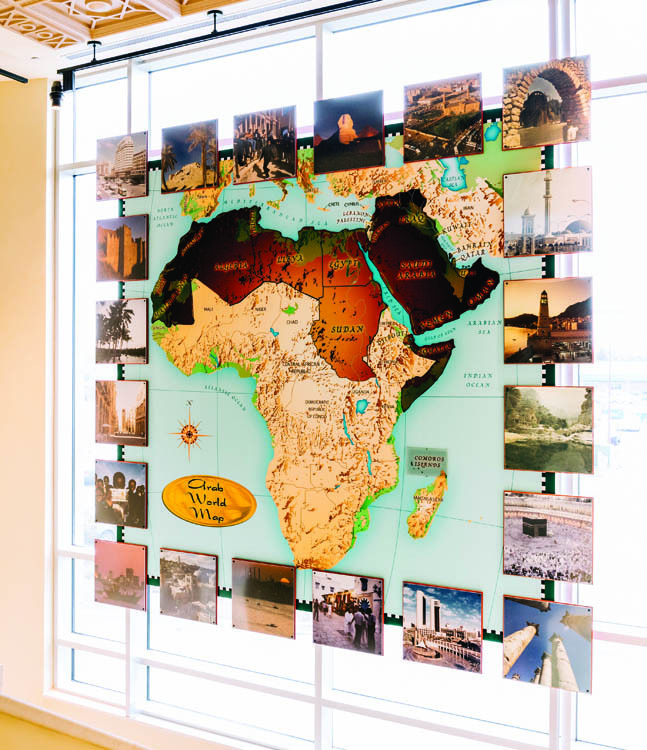 The museum, which marked its 10th anniversary this year, has grown and evolved from a room at ACCESS (Arab Community Center for Economic and Social Services) to its current home at Michigan Avenue and Schaefer Road. As the years progressed, so did the museum. It created conversation among ethnic communities. Anan Ameri and Ismael Ahmed, co-founder of ACCESS, discussed the plan for the AANM in 1998, brainstorming its driving force: to be able to tell the American story of the Arab-American community. The country seemed to have a misunderstanding of Arab-Americans, Ameri says. Ameri worked in ACCESS as the director of the cultural art program where the museum began. The program showcased exhibits and performances. With a small space in the ACCESS building, she struggled to find suitable places for events. But the program served as a starting point. In 2000, Ameri, with the assistance of ACCESS, purchased a boarded-up furniture store where the museum now stands. She met with museum experts, researched, and talked to people at other cultural institutions like the Japanese American National Museum in Los Angeles. Then the bombings on Sept. 11, 2001, shook the U.S. to its core, painting a negative picture of Arab-Americans. Individuals from war-stricken countries pulled back their involvement in the institution, making that incident one of the most challenging for the museum’s development. Their fear for the safety of their family was more important then telling their stories. If he or she declined to talk, Ameri thanked them for their time and moved on to the next person. She continued the search for stories and traveled across the country in late 2002, speaking to members of the community and focus groups in places like Boston, Los Angeles, and New York and asking how they wanted to be represented in a museum. She took notes, paying attention to their requests. For eight months, Ameri traveled, took more notes, and brainstormed along with whoever accompanied her on the trip. Representing a culture in 22 countries appeared challenging. But Ameri and her team noticed common themes within the responses from the community. 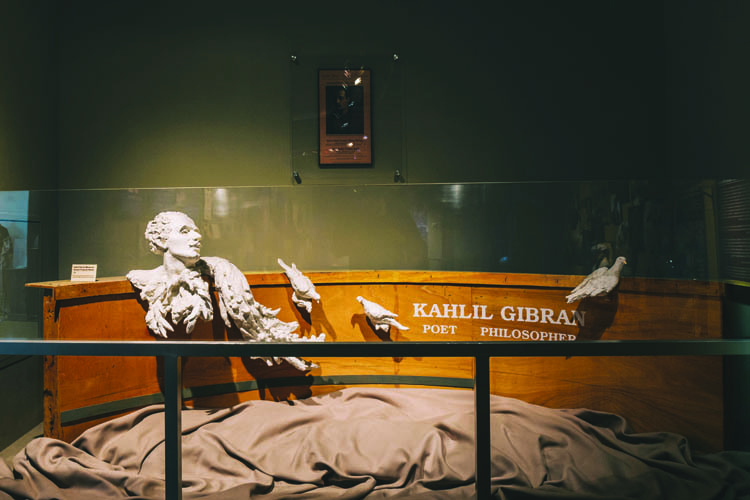 Key elements such as life in America and making an impact divided the museum into sections as a way to avoid focusing solely on the rich and famous. In May 2005, Devon Akmon, the curator of community history at the time, and thousands of people attended the opening of the building. Parts of Michigan Avenue closed down for the celebration of the first Arab-American museum. In July 2013, Akmon took over as director after Ameri retired. Ninety-five percent of the museum’s artifacts and documents are donations. These objects illustrate the Arab-American experience, and the collection includes art, personal papers, and other items such as the personal typewriter of iconic journalist Helen Thomas, who covered the administrations of several presidents. But being famous is not a requirement to donate. Everyday Arab-Americans have given photographs, books, and inventions to the museum for guests to learn about their stories. Lyla Saigh’s donation included the memoir of her mother, Rosemary Hakim, who won the first-ever title of becoming Miss Lebanese America. Hakim completed nine chapters of the memoir. It was never published, but she chronicled her time in Lebanon as well as living in New York in the early 1960s, working for the United Nations. As a clerk, she became involved in developments for the Arab world such as the Algerian Revolution and the Suez crisis. A recent and unique addition to the collection is Daytrader, a board game created by Samir Lyons, a computer animator from California. Nearly three years ago, Lyons reviewed his stocks online and wondered why there was not a game like Monopoly that was focused on the stock market. He developed a plan and worked with designers to create the game, which made its way to the website Kickstarter, gaining positive reviews from customers. A few teachers used the game to teach students about the stock market. After the launch of the game, Lyons received a phone call from his uncle Salah E. Salah, who is involved with the museum. This year Ameri, Akmon, and supporters of the museum welcomed to the institution The Annex, a 4,700-square-foot addition. It’s a multidisciplinary space for community engagement programs, Akmon says. To celebrate the 10-year anniversary, the museum presented Ten: The Exhibition, which runs until October. 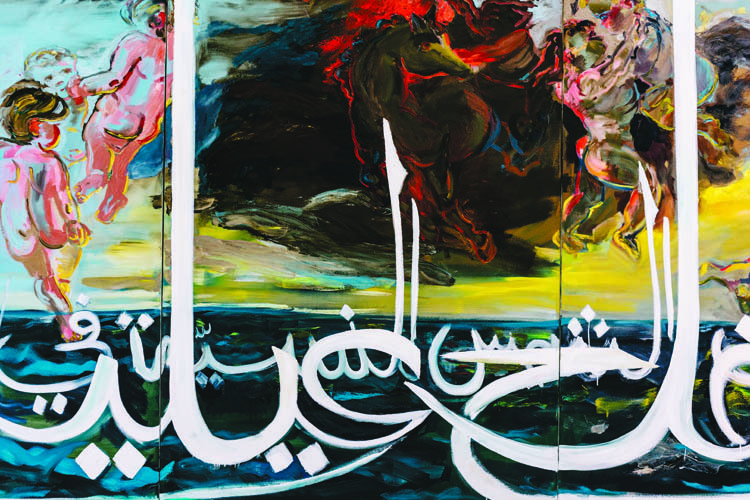 Ten Arab-American artists showcased their work in the Main Floor Gallery, containing aspects of the community’s experience. And while Ameri asked the community how it would like to be represented in the early 2000s to get the museum started, Akmon says he still found himself asking the same question. 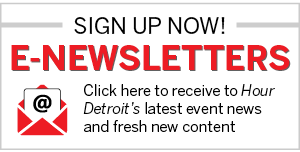 13624 Michigan Ave., Dearborn; 313-582-2266. The museum is open 10 a.m.–6 p.m. Wednesday through Saturday and noon–5 p.m. Sunday.